"As Olympic athletes we have a responsibility to be role models and set an example." Athletes usually spend the final few days before a major sporting event with their heads down and concentration faces on as they fine-tune those last-minute details, ensuring peak physical and mental condition. But the British Sailing team had an altogether different plan before this week's Princess Sofia Trophy regatta - picking up litter. In a bid to raise awareness of plastic pollution, the British team joined hundreds of sailors from around the world in taking to beaches in Arenal and Can Pastilla in Palma, Majorca, last week. 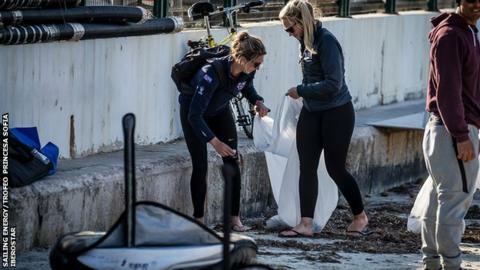 The clean-up was led by a group of sailors which included British Olympic gold medallist Hannah Mills, who has previously addressed the International Olympic Committee and UN Environment on sustainability in sport. The sailors are using the hashtag #Sailors4TheSea and cleaned the beaches of dozens of sacks of rubbish. "The beach clean was incredible," said Mills, who won women's 470 gold in Rio alongside Saskia Clark. "Sailors, coaches, locals and kids came together to pick up litter and plastic from the beach where we are racing from. "The beach clean stemmed from a group of sailors wanting to do more - to raise awareness of the plastic problem which is everywhere, nowhere is exempt. "We have the power to make sure our events are as sustainable as possible and the knock-on effect is exponential." The Princess Sofia Trophy regatta - the first major regatta of the European Olympic classes season - gets under way on Monday.